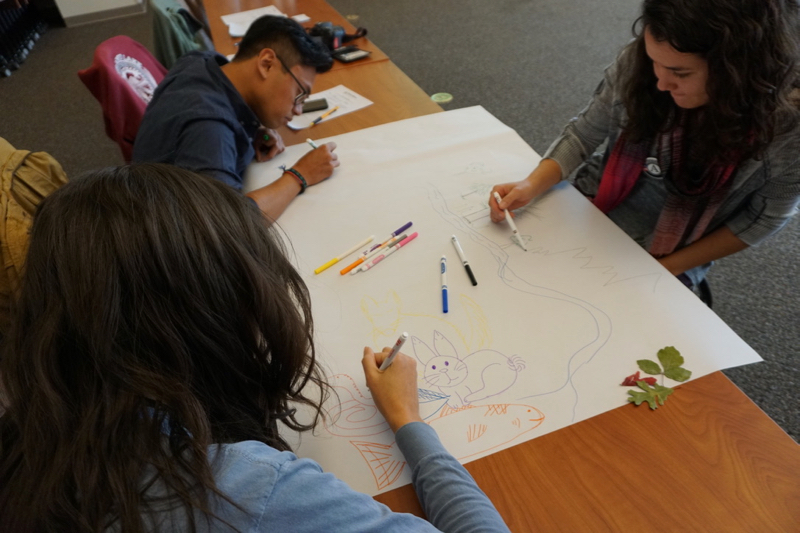 On a Monday morning in mid-October, 2018, several small groups of students from Pyramid Lake Junior/Senior High School gathered around tables inside of a conference room at the Desert Institute in Reno, sketching ideas, visions and plans of what they want life on Earth to look like for future generations. Schuyler Chew, a University of Arizona graduate student who is currently studying climate change resilience and vulnerability with the Pyramid Lake Paiute Tribe, encouraged the students to incorporate indigenous language, words, drawings, maps, poems and stories into their drawings. “Enlightenment. Growth. 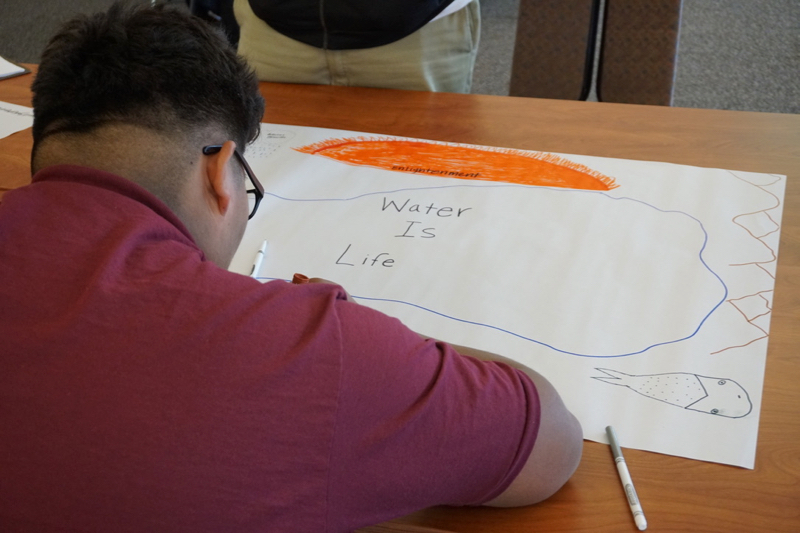 Water is life,” one group of students wrote on their poster paper, with key words and themes surrounding a drawing of Pyramid Lake. Another group sketched native wildlife and buildings outfitted with solar panels. A Youth Day participant sketches his vision for Earth’s future. Oct 15, 2018. A team of Youth Day facilitators adds their visions for the future. Oct 15, 2018. The activity, part of a day-long event called Youth Day, was one of many hands-on activities, presentations, and discussions designed to engage the students in thinking about how to embrace the challenges of the future with regard to climate, water and food. “The young people here today are incredibly gifted and creative, and our communities will rely on them to employ those gifts in facing the challenges of water, food and climate in the future,” said Meghan Collins, youth engagement coordinator for the Native Waters on Arid Lands project and Assistant Research Scientist in environmental science at DRI. Although the NWAL project did not initially place an emphasis on youth engagement, early feedback from project participants from various tribes was that they did not want to be talking about issues of climate without including younger voices in the conversation. 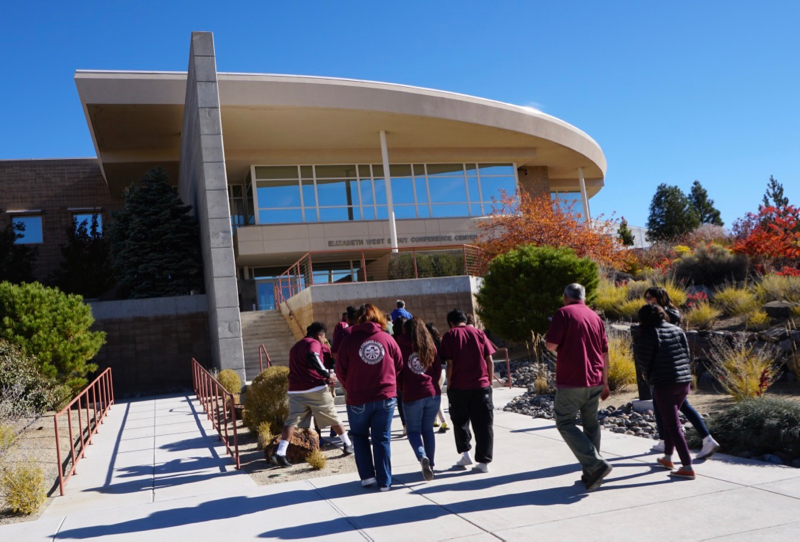 In response, the NWAL team has held a series of events for tribal youth and college students at locations such as Salish Kootenai College in Montana, Navajo Technical University in New Mexico, and DRI in 2017 and 2018. 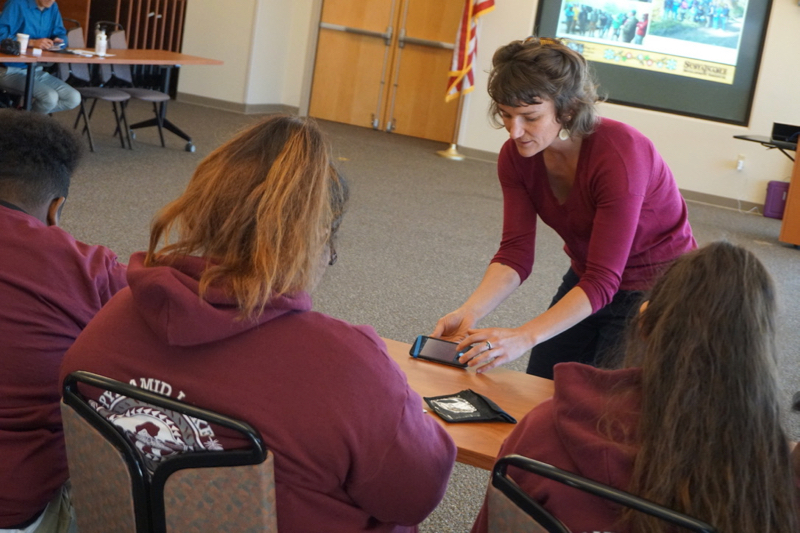 Youth Day organizer Meghan Collins of DRI instructs students in the use of Stories in the Snow kits. Oct 15, 2018. During the course of their day at DRI, the group heard from Chris Caldwell from the College of Menominee Nation in Wisconsin, who discussed the work that he does with the school’s Sustainable Development Institute. Skyler Chew, the graduate student from Arizona State University, described his research on climate change resilience and vulnerability with the Pyramid Lake Paiute Tribe. Steven Chischilly, Associate Professor at Navajo Technical University, described some of the educational opportunities available at his school in New Mexico. Collins, the event organizer, led the students through an outdoor activity using Stories in the Snow macro-photography kits to explore the environment on the DRI campus and get a taste for scientific inquiry. 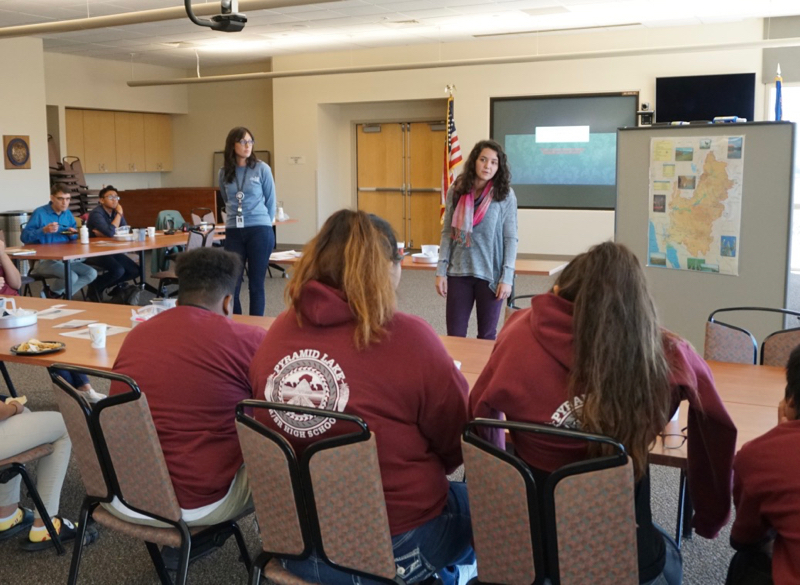 DRI’s Science Alive Americorps volunteers Brooke Strathis and Chelsea Ontiveros concluded the event with an activity on the salinity and water quality of western rivers. DRI Science Alive team members Brooke Stathis and Chelsea Ontiveros lead an activity at DRI Youth Day. Oct 15, 2018. Native Waters on Arid Lands is funded by a five-year, $4.5 million grant from the U.S. Department of Agriculture’s National Institute of Food and Agriculture. Partners in the project include the Desert Research Institute, the University of Nevada, Reno, the University of Arizona, the First Americans Land-Grant Consortium, Utah State University, Ohio University, United States Geological Survey, and the Federally Recognized Tribal Extension Program in Nevada and Arizona.